My Mom often made this as an after-school snack. Slightly spicy taste from the green chilies, tang from the lemon juice and sweetness of fresh coconut all come together to take something as flat as Poha to another level.. if you put crushed Poha Papad on top, it tastes like heaven! 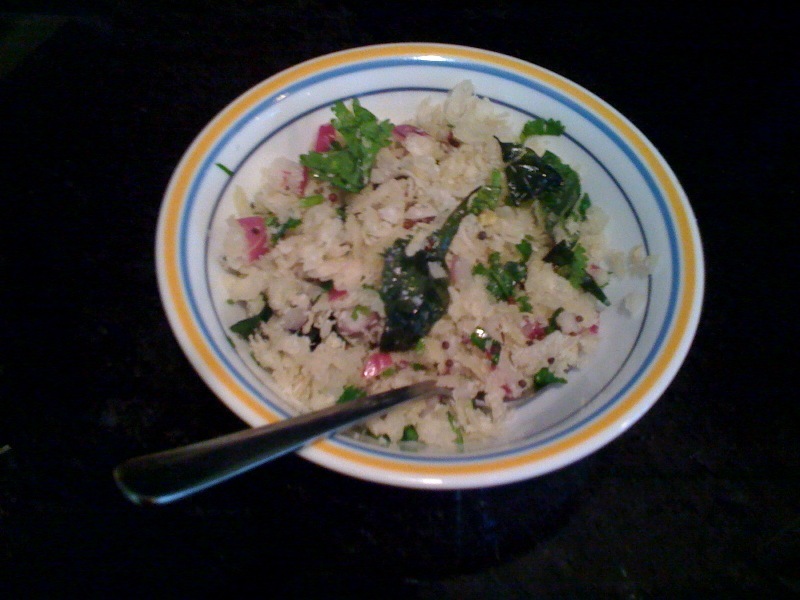 Add the green chilies, ginger, salt, sugar, onion, coconut to the poha in a bowl. Mix well till the poha starts to soak the moisture from the coconut and onion. Add lemon juice and mix well. Immediately start making the tadka before the poha becomes too soft. Heat oil, then add hing and mustard seeds to the hot oil, once mustard seeds start to crackle, add curry leaves and daliya or peanuts and stir for half a minute. Then pour this tadka over the poha mixture and lightly mix it in. Garnish with fresh coriander leaves and crushed-deep-fried poha paapad! Perfect snack for a summer evening..
and a Gujarati will make Dhokla out of any ingredient, even Poha!! :)....will share soon. very intriguing.. I look forward to the post! How come gujaratis dont have a parallel recipe for this one? Never had anything like this! !